On 26.09.2011, the Ghana Football Association published the squads for the GLO Premier League 2011-2012. In this post, I will make some comments about Berekum Arsenal FC. Berekum Arsenal FC will kick off the GLO Premier League 2011-2012 later today (against Hearts of Oak SC). Last season, Arsenal switched between using the experienced Thomas Tuah Asare and Haruna Razak as goalkeeper. Asare has not been registered this season, while Razak has joined Ebusua Dwarfs. I therefore believe that new signing George Cudjoe will be first choice between the sticks. Cudjoe was last seen as the backup goalkeeper at Kessben FC (now Medeama SC). 20-year old central defender Akwasi Acheampong should lead the defence this season alongside new signing Mutalabi Mohammed from Asante Kotoko FC. Mohammed did not play any matches for Kotoko last season and will need to get his career back on track. Arsenal should be the perfect club for this. Mohammed Basha is the regular left-back. Arsenal has several options in the middle of the park. Shaibu Adams and Abu Issah are hard-working defenders midfielders and should perform a great platform for returnee Frank Yeboah. Yeboah failed to break through at Hearts of Oak SC but the experienced central midfielder is a quality player and had several great seasons at Arsenal. Other options are the youthful Emmanuel Osei Kuffour, Jafar Danjuma, mostly known for his performances for Gamba All Blacks FC, petit winger Joseph Masel, formerly of Ajax Cape Town FC(South Africa), and attacking midfielder John Asante Owusu who was a fringe player at Medeama SC last season. The lanky Bennett Ofori and the energetic Collins Agyei Pele are very important to the attacking play of Arsenal. Ofori is primarily a left-winger while Pele is primarily a right-winger, although both players can play in more central roles as well. Both players will most likely score a few goals as well. Last season’s top scorer Nana Poku has left the club and James Boadu has been brought in as replacement. Boadu, formerly of Genclerbirligi Ankara(Turkey) and Vllaznia Shkodër(Albania), joins from Medeama SC and I personally think this is a wonderful signing. Boadu will become the number one striker at Arsenal which will do him good. The picture is of Boadu and is taken from Ghanasoccernet. Enock Asare, formerly of Kessben FC, was once regarded as a major talent and he will be trying to kick-start his career. 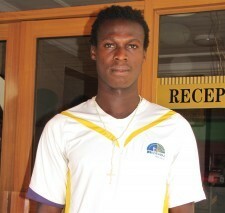 Attacker Joseph Akowuah Mensah was a key player for Hasaacas FC when they were in the GLO Premier League in 2009-2010. Eric Asiedu and especially Ernest Obeng will also need to chip in with goals. Arsenal has lost several important players during the summer, including central defender Kofi Agyare (Hearts of Oak SC), defender Osei Berko (Medeama SC), and midfielder Seidu Yakubu (Medeama SC) and Nana Poku, who scored 16 goals last season. Veteran defender Stephen Amankwah and playmaker Richard Osei Bonsu have apparently left the club as well. Arsenal has registered a player called “Prince Amponsah”. If this is the former midfielder of Asante Kotoko FC, born 23.04.1988, it is a very interesting signing. Amponsah was highly regarded in 2007-2008 and 2008-2009 but then completely disappeared from my radar. The registered “Isaac Amoah” could be the attacker who was a fringe player at Liberty Professionals FC last season. Ernest Acheampong, Prince Ahenkan Adjei, Isaac Amoah, Prince Amponsah, John Arifa, Akwasi Awuni, Ebenezer Azumah, Prince Baffour, Awudu Ganiyu, Mohammed Hamza, Osman Moro, Joshua Naibo, Abraham Nyarko, Douglas Opoku, Kyekyeku Oppong, Samuel Wiafe, Massah Yahaya, Kwabena Yeboah.